The quality of drinking water can change or become contaminated with harmful bacteria at any time. Homes with water supplied from a well situated close to intensive dairy farms are particularly vulnerable to changes in water quality. Ground water and surface water can be impacted by large slurry producing dairy farms. Slurry seeping from a leaking slurry tank or from over-spreading on land can leach into groundwater and even small amounts of slurry can infect a water supply with bacteria miles from the original source. Sterilight Cobalt’s compact, point-of-entry water treatment system, combines both disinfection and filtration. These systems feature high-output UV lamps, axial flow reactor UV technology, simple installation, and take up the least amount of space compared to other UV systems. The system has a 1″ FNPT inlet connection and a unique combination port (3/4″ FNPT & 1″ MNPT) on the outlet connection. This compact unit incorporates Sterilight’s Cobalt™ disinfection system and two, Big Blue size (4-1/2″ Diameter) filter housings, all on the same installation bracket. Inactivates chlorine-resistant parasites such as Cryptosporidium and Giardia. Kills harmful bacteria like E.Coli and viruses not visible to the naked eye. Easy UV lamp and cartridge replacement with quick disconnect fittings. Durable stainless steel chamber prolongs life and eliminates ultraviolet light degradation. 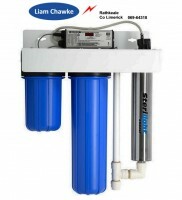 Equipped with a 5-micron sediment pre-filter to reduce particles in the water. Equipped with a 5-micron carbon filter to reduce taste and odour of chlorine. High flow polypropylene filter housings (10“or 20“ options) with 1“ full flow connections. For more information or to see a demonstration of the UV Water Purifer, call Liam Chawke Electrical & Water Pumps at 069-64318 for more information. If you are worried that your well water supply is infected with bacteria such as E Coli, Cryptosporidium or Giardia, we recommend having a water test carried out. Complete the Water Test Request form below and we will send more details.